Here is my cable chain...is there a weak link? Thread: Here is my cable chain...is there a weak link? I'm starting to look at maybe upgrading cables in my system. Here is what I'm using on my digital playback side. See if you see a weak spot and what you would upgrade to. Seems to me you have some decent cables in your chain. Just personal taste but I didn't like the XLO's I tried. Seems to me that cables are a very subjective part of the whole picture. As you well know they can create some heavy debate. at Peabodys and I was then made a believer that cable is not the same. I recently had the chance to listen to interconnects and speaker wire sent from Leroy for a few months. He sent me Blue Marble cable and speaker wire made by his dealer....the stuff was outstanding in my system. I my self have all interconnect and speaker cable by Analyst Plus in my system and will be moving up the chain with their speaker cable and interconnects. Interconnects can make your system sound flat, lively, warm, or just plain old different. Good system matching is very important with interconnects and speaker cable. Today I received two pairs of Moon Audio Silver Dragon interconnects from a guy on audiogon. I had decided it was time to trade out some of my cabling and see if I liked the changes. I replaced my XLO cable that was between my headphone amp and my integrated tube amp. Mr. Peabody had suggested that might be a good place to start. I noticed an almost immediate improvement in the high end. Jazz horns and cymbals are a very difficult thing to get right and these all but leapt from the tweeters. There was a clarity that was unheard of before. Next I tried some piano by listening to Beethoven's 3rd piano concerto. The piano had just the right feel, as if I was sitting at the Kimmel Center center stage. Next I cued up some rock as I pulled out Rush's Moving Pictures deluxe CD that was part of the recently released Blu-Ray disc set. I played what I consider one of their truely underappreciated tracks, "Vital Signs". The Rush fans out there know this album as well as any in their catalog I suspect. To say it raised the hair on the back of my neck is enough of a tribute to these cables. I don't always hear the difference that cables make in my system, but that is not the case with the Dragon. Now I have to decide where the other pair will serve me best. Thanks Mr. P, you were right. Nice to hear that Jack. As you know I believe a system should at least have the same brand cable through out. I dont know if you want silver through out but at least the same brand. As you know, Analysis Plus cabling works great in my system for two reasons...they make my system sound great, and the price is right. in the Future I will be moving up in the brand, but I recently got a Analysis Plus Phono cable that is a copper/silver hybrid and man...it really exposed the stock cable that came with the mmf-7.1 as cheap cables. So when switching out your cabling dont forget the phono cable as well...and if at all possible, if you are satisfied with Moon cable, try there phono cable as well if your TT will allow it. And btw...how are you enjoying the 5.1? I love the 7.1. One reason why I went with this table is because I was satisfied with the 2.1....and I like the fact that Music Hall like Pro-Ject is pretty much plug and play. I really don't want to buy a Table where you purchase and add many of the upgrades to get the best sound....just plug and play with a few tweaks and good cart, and you are set. Like you, I upgraded from the 2.1 because I really liked the sound of the MH compared to the Dual that I owned previously. I was thinking of a cartridge upgrade, but I might go full TT upgrade. I have some gear around the house that I need to get rid of and see how the finances look then. I would like to see some meaningful test results comparing cables/interconnects, since these are relatively simple conductors compared to amplifiers, CD/DVD players, phono cartridges, etc. I saw some cable/interconnect "test results" many years ago but the test frequencies were WAY above the frequencies existing in any signal input into or output from ANY piece of audio gear. I liked the way you think as far as using the same cables, so I've been in touch with Drew at Moon Audio and he's going to hook me up with a Silver Dragon phono cable. I sent him pictures of mine so he could see which version it was and being the latest version he had two left in stock. I'll use the second set of Silver Dragon interconnects that I got to connect the phono amp to my main amp. Jack...are you in Wilmington NC? I just now noticed that in your name. No Wilmington, Delaware. If I was in NC, I could take a trip to the Moon Audio facility. Hey by the way, do you know if Mr Peabody is on vacation? Haven't seen his posts pop up lately. I moved from Durham/Raliegh to St. Louis and noticed Wilminton. And yes I knew Moon Audio was in Carolina as well. I thought that was the reason for you and Moon Audio. Peabody is not on vacation. He changed his ISP from ATT to Clear and now he is being blocked from AR for some reason. We can't seem to figure it out. You got any suggestions? I had read a review on the Silver Dragons and when I saw the two pair of interconnects for sale, I remembered what you had said about using cables from one manufacturer. The moderators can't help Peabody? With Verizon I sometimes have problems because I also use their internet security. I had trouble with Turbo Tax at first. Something to do with the firewall, but that got fixed. Tell him to keep poking. Yeah..its not proxies, nor firewalls. Some one told him to run a tracert but I didnt think that would solve the problem but told him how to run it any ways..... hops completed and no break downs. I think its with his internet company. Did you get the phono cable yet? if so how do you like it? For a person whose system is entry level, mid-range, or even low-end-high-end (like mine), money is usually better spent improving other components than cables. E.g. rather than spend $300 on "audiophile" interconnects, buy decent, professional quality I/Cs for $35 from, say, Blue Jeans Cable, and spend the difference on your speakers or amp. 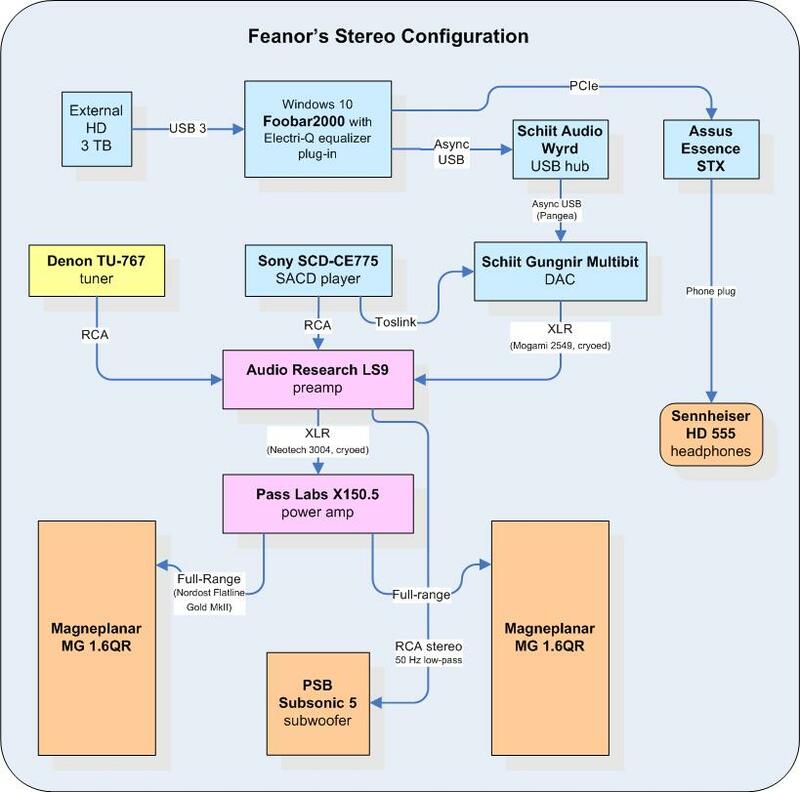 The exception to this strategy might be if you want to "color" your sound in some way to compensate for colorations in the connected components. In this case the choice entirely depends on the other components, and general recommendations about this or that brand aren't useful. Phono cable arrives tomorrow. Then I'll be running Silver Dragons all the way from my TT to my amp. If I had Peabody's problem, that's what I would suspect. It was working fine till he changed his ISP. Once I had gotten my DAC, I was pretty happy with my components Bill. That's when I started looking at my cables. The guys at my local HiFi shop call me a tweaker. There is good fun to be had in tweaking and occassionally some real improvement. But consider that people who get carried away with tweaking can be "missing the forest for the trees", especially it it's costing them real money. Keep us posted on the performance once you get your cables. Agreed for sure. I have lots of "tweaks" lying around in closets and drawers that didn't cut the mustard. Lots more that I have sold cause they didn't work in my system. I'm also thankful that my dealer will let me take home different pieces of gear including cables to try out in my system.